That is cute, thanks for sharing with us at CCCB! Thank you for entering your cute card into my Animal Magic challenge at CCM. Love that kitty popping out of the Christmas stocking! Precious!! Cute,cute! love it. Adorable kitty, great CAS background too. Wonderful Christmas card. Thanks for sharing with this delightful card with us at Crafty Cardmakers. Super use of those traditional colours and a really cute kitty too. 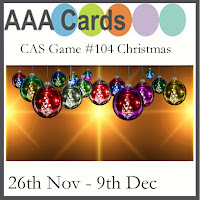 Thanks for linking up at AAA Cards. 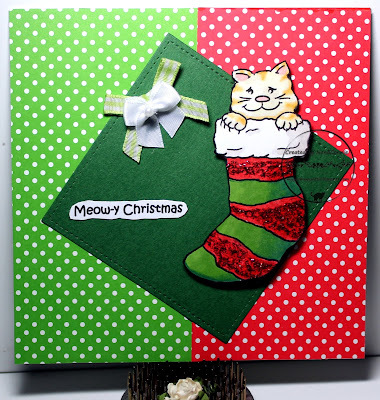 Such a cute card - I love the sweet kittling and your colouring is fabulous. Really cool card design layout. What a cute festive card! Thanks for playing along with us at AAA Cards!